Most college students, especially those unfamiliar with career fairs, view the prospect of attending a job fair with some trepidation. How can you effectively navigate this scene when there are many other candidates clamoring for attention from a large number of assembled employers? Here are a few tips on how to optimize your comfort and success at a job fair. What Is a College Career Fair? 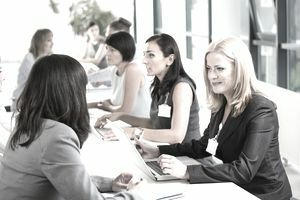 A college career fair provides students, and sometimes alumni, with an opportunity to meet with a variety of prospective employers on campus or at an off-campus site. The program may have a networking component where you meet casually with employers at tables or booths set up in the event venue. There may also be an opportunity for one-on-one interviews with hiring managers from participating organizations. These organizations may be recruiting for internships, summer jobs, post-graduate positions, or they may be participating to generate interest in future openings at the company. Attending a career fair is an ideal opportunity for exploring career options available at a variety of organizations. That in-person connection will help you get noticed and your application considered by employers. Look for a list of participating employers on your school's website in advance of the program or contact the job fair sponsor to inquire about recruiting organizations. Formulate a prioritized list of employers you'd like to meet within industries of interest. Research as many of these employers as possible. Learn a little about their recent successes and challenges. Try to find a genuine angle as to why they appeal to you given your own values and interests. Prepare a list of question to ask to avoid being stuck not knowing what to say when you meet a recruiter. Carefully review the career, job, or human resources section of the company website to identify internships or jobs which are a good match for your interests, skills, values, and experience profile. Prospective college graduates should pay close attention to training programs. Prepare a statement or two to clearly convey why some of these jobs or types of jobs are a good fit given your strengths and interests. Prepare a general "elevator speech" or short presentation of 20 - 30 seconds which you will use to introduce yourself to employers. To do this, try to think of 5 - 7 reasons why you would add value for most employers. Ask friends, advisors, parents, past supervisors, faculty, and others who know you well for suggestions. Analyze your past successes as a student, volunteer, friend, employee, intern, and campus leader and identify assets which have helped you to produce those successes. Carefully prepare your wardrobe and appearance for the event. In general, err on the side of being overdressed as opposed to underdressed. You'll make a better impression if you are dressed very nicely. Do analyze the culture of your priority employers and show more flair if you are targeting firms which value creativity in dress, such as companies in the fashion industry. Arrive early so that you can access your priority employers before they are overcrowded with applicants. Try to cover as much territory as possible during the day, since you may be surprised by employers with whom you were not originally familiar. Don't be overly preoccupied with brand name employers since they may have the most competitive employment scenarios. Smaller employers who are not well known may offer wonderful opportunities and allow young hires to take on broader and more responsible roles early in their career. Maintaining a positive, energetic attitude throughout the day will be critical to your success. Even though you may be articulating similar statements many times during the day, remember that it is the first time that each employer will be hearing from you and keep it fresh. Stand up straight, lean slightly forward to engage the recruiter, vary your vocal tone to punctuate your statements, and exude a smiling, positive energy. If you have a genuine interest in the employer, towards the end of your interaction, verbally affirm your interest in working with the organization or to further explore opportunities. Everything being equal, the most enthusiastic candidate will often gain an edge with competitive employers. Collect business cards from employers of interest so you'll have contact information to use to follow up after the program. Effective follow-up after the program will be essential for moving your employment prospects forward. Make sure you get the contact information for any of the interesting recruiters with whom you have met. As soon as possible after you leave the event, compose a communication to them which briefly conveys why the firm is an excellent fit given your background. Make sure that you communicate a strong sense of your interest in a future meeting with the organization to explore opportunities further. Thoughtful preparation prior to a job fair, effective execution at the event, and high-quality follow-up after the program can go a long way towards generating job offers from your next career fair experience.